This Saturday is Home Movie Day! People are getting together all around the globe to screen their home movies on August 11th. Home Movie Day is a fun annual event that anyone can be part of (you don't even need any movies - just come to watch the celluloid flicker by! 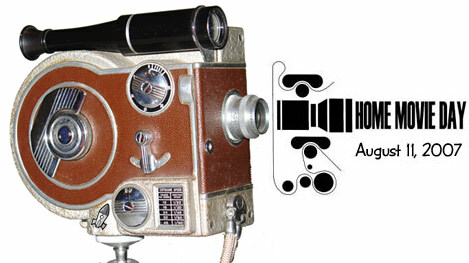 ), and here at Retro Thing we're posting home movie related gadgets and gimmicks counting down to the big night. 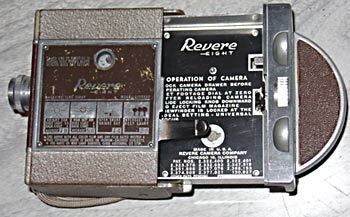 Here is one of the most gorgeous cameras I've ever seen; it's the diminutive Revere Model 70. It's from 1947 and shoots 8mm film, but it's unusual in that it shoots "magazine 8" that loads via a sliding drawer. For a while some manufacturers experimented with preloaded 8mm film cassettes (much like the Super 8 cartridges that were to come 20 years later) instead of the conventional open reel. Some of these smaller magazine 8 cameras were marketed towards women as "fitting in your handbag" and "no complicated controls to master". Uh, okay - points for getting dad out from behind the camera, but let's be a little more enlightened about it. My favorite thing about this camera is the nautical look to the viewfinder, and the chrome switch that looks a little like an anchor. The camera is made of heavy steel, clad in leather, and together with the Bausch & Lomb optics this Revere is quality all the way. Don't forget that this Saturday night you can see movies made with cameras just like this one, so come on and join the fun!